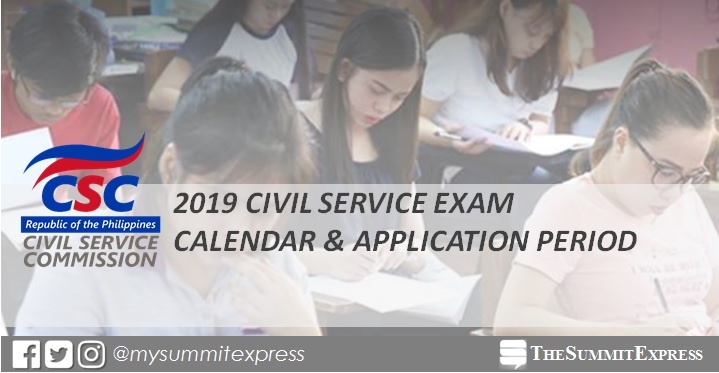 MANILA, Philippines – The Civil Service Commission (CSC) announced recently the schedule and application period for the civil service examinations to be conducted in 2019 via the Pen and Paper mode. Filing of application is now open for CSE-FSO. Administered in coordination with the Department of Foreign Affairs (DFA), the CSE-FSO is both an eligibility examination for government service and a qualifying test for the five-part Foreign Service Officer Examination (FSOE) of the DFA for which the CSE-FSO forms the first part. Applications for CSE-FSO may be filed at the DFA-Board of Foreign Service Examinations, Pasay City, until Dec. 6; or at Consular Offices within and outside Metro Manila, or at Philippine Embassies and Consulates or Missions abroad, until Nov. 29 only. Interested parties are strongly advised to access and read thoroughly the corresponding examination announcement through the DFA website www.dfa.gov.ph, or through the link www.dfa.gov.ph/images/2018/BFSE/Oct/2019-FSO-Announcement.pdf for details on testing centers, qualifications, application requirements and procedures, and other relevant information. Passers of CSE-FSO will be conferred the Career Foreign Service Officer Eligibility that is comparable to the Career Service Professional Eligibility and, at the same time, qualifies an individual to the second stage (preliminary interview) of the FSOE. The CSE-PPT for Professional and Subprofessional levels are open to Filipino citizens, regardless of educational attainment, who are at least 18 years old at the time of filing of application, and have not taken the same level of examination within three months before the date of examination. For the CSE-PPT scheduled on March 17, 2019, applicants must not take the same level of the examination from Dec. 17, 2018 to March 16, 2019. This rule, though, do not apply to applicants who would be taking the other level of the examination different from the examination level last taken, the CSC clarified. The CSC said there is no limit in taking the Career Service examinations, citing that an individual may continuously take the exams regardless of the number of times failed. Applications for the March 17, 2019 CSE-PPT may be filed starting Dec. 17 this year until Jan. 16 next year at the CSC Regional Office (CSC RO), or any of the concerned CSC RO’s Field Offices where the applicant intends to take the examination. The CSC will issue, and post on its website, an examination announcement for details on testing centers, documentary requirements, and other information regarding the CSE-PPT. Examination fee for CSE-PPT is Php500. The career service exams would result in the conferment of either Professional or Subprofessional eligibility appropriate for appointment to corresponding positions in the government. The BCLTE and the ICLTE are part of the Standardized Examination and Assessment for Local Treasury Service (SEAL) Program of the Department of Finance (DOF). The BCLTE aims to establish a Register of Eligibles for Local Treasurer and Assistant Local Treasurer positions, and to positions under the Financial Services in the civil service, except those requiring practice of profession or are covered by Bar/Board and special laws. The ICLTE forms part of the assessment of the DOF in the selection, appointment, designation, and promotion to higher positions in the local treasury service that also do not require practice of profession and are not covered by Bar/Board and special laws. Passing the BCLTE would result in the conferment of the Local Treasurer Eligibility which, in turn, is a pre-requisite to qualify to take the ICLTE. As to the Pre-Employment Test, Promotional Test, and EOPT, the CSC said these are all institutionalized examinations that serve as human resource tools or mechanisms that government agencies may choose to adopt as part of their internal rules on recruitment and placement. In particular, these tests intend to initially filter applicants for employment and promotion. Stay tuned here for full details of 2019 examination especially for CSE-PPT. You may also refer to the official website of CSC for more information.